For security dealers and integrators who rely on recurring monthly revenue (RMR), to grow their business, the obvious path to growth is to acquire more customers. An equally valid approach, however, is to upsell an existing customer base by increasing the number of monitored endpoints. This approach has led some alarm dealers to expand their residential security portfolios to include smart home applications; for commercial integrators, the opportunity is to bring this smart home model to non-residential customers by offering smart building applications. As an example, look at a typical high school customer. They probably have an access control system, motion detectors, glass break, door contacts and maybe some panic buttons, along with fire alarm pull stations, smoke and CO detectors. This sounds like a great customer already, but now you can take it a step further, moving outside of the typical security mindset by expanding your portfolio to include environmental monitoring. Water damage from a leaking water heater, an over-flowing sink or a failed sump pump can quickly result in high repair costs for a customer. Compared against the potential thousands of dollars or more of damage, investing in water detectors can be an effective way to help them avoid such problems. Similar to leaking water, a burst pipe can result in a quick accumulation of a large volume of standing water. A threshold alarming temperature detector is a great tool to make sure a customer knows when pre-freeze conditions exist so they can act before the problem occurs. Particularly beneficial for offices, bank branches, schools or government buildings, even if the smallest of computer rooms gets too hot or has water collect where it shouldn’t, tens of thousands of dollars in electronic equipment is at risk. In addition, these customers rely on their computer rooms to perform mission-critical functions – if the computer room goes down, they go down. Here again, a threshold alarming temperature detector or water detector can alert the customer with sufficient notice to respond before the problem becomes catastrophic. A storage facility or a storage area within a customer’s building may need to stay within a specific temperature range – and the area usually must stay dry. Again, the cost of environmental detectors compared to the losses at stake is a small price to pay to ensure what they are storing is protected. Refrigerators and freezers must stay within specific ranges to make sure the items inside are safe. Threshold alarming temperature detectors can alert customers as soon as a refrigerator or freezer starts to drift from the designated set point. This is a much better approach than not knowing whether what’s inside has been properly stored. 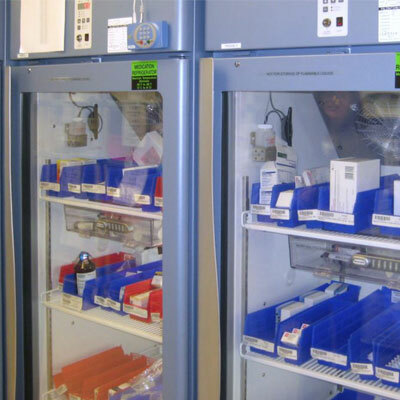 Per local health department and Centers for Disease Control guidelines, certain applications require temperatures be recorded at regular intervals to ensure food, pharmaceuticals or vaccines are properly stored and fit for use. For security dealers and integrators looking to expand into environmental monitoring, undertaking the development work necessary to enable your system to log temperature readings can open business from new customers and new services. Convenience stores, restaurants, pharmacies and related businesses must keep temperature logs – and today many of them do so manually. Helping them automate this process can reduce labor costs and ensure logging accuracy. Offering environmental monitoring gives security dealers and integrators the ability to seek different buying centers within an organization. For example, the facilities manager may be interested in water detection, while the IT director may be concerned about the computer room. The end-result is a broader relationship with your existing customers by helping them gain additional value from their system investment. Similarly, offering such services can help attract new customers where environmental monitoring becomes a point of differentiation between you and competitors who solely focus on security monitoring. In addition to the potential RMR increase, there is another benefit. Remember the building automation providers mentioned earlier? As the Internet of things (IoT) becomes more of a reality, it also dictates customer expectations and begins to blur lines between security and building automation providers. Security integrators who do not have the capability to offer services beyond just intrusion and fire alarms run the risk of not being able to meet their customers’ changing environment. In this light, environmental monitoring is not just a nice to have, but a required capability to remain competitive. For new construction, installing a wired security system is straightforward. But once that building is complete, it may not be practical to add wired environmental monitoring endpoints. Line power, if needed, may not be available at the installation point and completing a home run wire back to the panel could be cost prohibitive. Getting comfortable with wireless systems can open up your business to additional revenue streams you may not have previously considered by focusing on wired alone. For some customers a 100 percent wired system may not be an option, such as a school or hospital interested in providing duress pendants to staff. Another example is retrofits for historic structures or cultural facilities where the last thing the customer wants is an installer cutting holes in walls or exposing wires that compromise the visual appeal, or fabric, of the building. Wireless solutions are tailor-made for retrofits and additions on existing buildings. Being battery powered, access to an outlet is not an issue and with wireless signaling there is no cost to run wire. Further, wireless can be a great option for expansive sites such as warehouses or large campuses where running wire is cost prohibitive. In such situations, alarms from both wired and wireless endpoints can be received by a single security panel making for an easy integration. Success for these situations hinges on making sure you use the right wireless solution for the job at hand. Look at the complexity of the customer’s site. Commercial customers require commercial-grade wireless systems compatible with the security panels you typically deploy. Scott Fincher and Michael Um are senior product managers at Inovonics, responsible for environmental and security product lines, respectively. Request more info about the company at www.securityinfowatch.com/12013994.